The official titles of the works performed here are not helpful: what they conceal are the most extraordinary soundworlds from two composers at the vanguard of the contemporary Polish music scene, and the magicians of the Royal String Quartet summon from their instruments sounds of collective and individual wonder. This is music to grab the attention of its audience—whether willing or not—and it will leave listeners emphatically having chosen a side of the fence. The names of Paweł Szymański (born 1954) and Paweł Mykietyn (born 1971) may not be as widely known as those of Polish composers born before the Second World War, such as Witold Lutosławski, Krzysztof Penderecki or Henryk Mikołaj Górecki, all of whose string quartets have been recorded on Hyperion by the Royal String Quartet. Yet within Poland, Szymański and Mykietyn have long been regarded as being in the vanguard of a new direction in Polish music. Their outputs span chamber and orchestral music, choral and vocal music, opera, and music for the theatre and film. Paweł Szymański initially came to prominence in the late 1970s having studied with major composers in Warsaw (Włodzimierz Kotoński and Tadeusz Baird) and Vienna (Roman Haubenstock-Ramati). From the outset his compositional voice and aesthetic approach were distinctive. His music reveals both a deep engagement with the conventions of the past and an ironic and sometimes unsettling distance from them. In many works his inspiration is the eighteenth century, as in the Sonata for violins, double bass and percussion (1982) or the orchestral Partita IV (1986). At the base of his music is often a fully worked-out canon or fugue that he then riddles with rests or attenuates beyond recognition. Szymański has called his treatment of borrowed or self-constructed material ‘surconventionalism’. Others might use the term ‘postmodernism’. His sources may stretch back to the medieval tune ‘L’homme armé’ (as in Lux aeterna, 1984) or to a more recent mazurka by Karol Szymanowski (in the Sonata). The Piano Concerto (1994), with the jazz syncopations of the first movement complemented by the quiet and extremely drawn-out polyphony of the second, is an example of Szymański’s fondness for bipartite structures. His range—from aphoristic pieces to extended works like his opera Qudsja Zaher (2005, premiered 2013)—constantly surprises, as do his often quixotic titles (such as Four Hevelian Dances for organ and two positive organs, 2011) and his reluctance to say anything about his music. 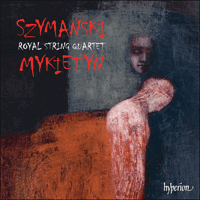 Szymański sometimes prefers noncommittal titles, exemplified by the three works for string quartet on this disc. The Two pieces for string quartet (1982) were premiered by the Musica Nova Quartet in Zakopane on 1 October 1983 during the 7th Szymanowski Music Days. They were composed, like the Sonata, to mark the centenary of the birth of Szymanowski, although if there is any source in his compatriot’s music it is well masked. The emphasis on the note E flat (Es in Polish terminology), might refer to the S of Szymanowski. But given the work’s completion in January 1982, just a month after the declaration of Martial Law in Poland, it might just as easily symbolize the suppressed trade union Solidarność (Solidarity). More importantly, this work is an early example of a bipartite structure, one whose musical language has little overt connection with external sources. The Five pieces for string quartet (1992) followed ten years later. They were commissioned by the BBC and first performed for a BBC Radio 3 broadcast by the Brodsky Quartet in August 1993. This work was written in memory of the Polish painter Jerzy Stajuda (1936–1992), who was renowned for his veiled images and paint washes rather than sharp delineations. Lutosławski was one of his many musical admirers. This set of five miniatures opens with Szymański in playful mood. The idiom initially sounds authentically eighteenth-century, but the figuration soon breaks up and then is stretched and distorted this way and that by glissandi, occasionally giving glimpses of a diatonic harmony. A quiet chord of E flat minor is soon dismissed and the first piece ends with a gruff exploration of the cello’s open-string C, the final instruction being ‘to finish this sound with a creak’. The tick-tock of the brief second piece (with E flat–A again at its heart) attracts a host of other impulses, until it is supplanted by striding bowed figures and a final flourish outlining a dominant 7th on F (which goes unresolved). The third piece perhaps most closely parallels Stajuda’s aesthetic. After a chiming of harmonics, Szymański introduces delicate trills, turns, and motifs suggestive of eighteenth-century figures that evaporate as soon as they appear. The last two pieces are more robust. The striding C minor arpeggios at the start of the fourth might suggest a link with American minimalism, but the almost immediate contrast with repeated G naturals indicates that Szymański has a different goal. There is a ferocity in the music’s tonal and figurative persistence that, in its confined context, achieves a cataclysmic collapse. The descending multiple tritones are crystallized in the fifth piece, whose insistent tritone F–B is briefly contextualized as part of another dominant seventh and offset by passing major/minor triads. The Four pieces for string quartet (2013) are dedicated to the Royal String Quartet, who gave the premiere during the Kwartesencja festival in Warsaw on 8 November 2013. The four sections run without a break. Their musical language demonstrates Szymański’s continuing fascination with tonal and stylistic referencing, and with elusive processes and enigmatic structures. The first piece begins forthrightly, with open and stopped strings, quarter-tone inflections and displaced unisons. Whether by accident or design, it uses a very similar cumulative pitch process to that employed by Lutosławski in the first of his groundbreaking Five Songs (1957): a ladder of thirds on ‘white’ notes, extending from D above middle C (to use keyboard terms) up to the B above the treble stave. These seven pitches are interlaced with the five ‘black’ notes. Alongside its greater rhythmic liveliness and more extended timespan, Szymański’s version of this process differs from Lutosławski’s in that the chromatic (‘black’) notes are often three-quarters of a tone flat rather than just a semitone. The pattern is broken by high unison F sharps that lead into the second piece, with its initial focus on high Cs. Szymański’s variable ostinati are articulated here by vividly contrasting timbres. A brief skewing of the material heralds the start of the third piece. Although it begins with repeated minor thirds, recalling the first piece, the third soon darts off in wild and almost comedic abandon, sinks down in a group glissando, pauses, resumes, and stutters its way into the finale. This picks up on the group glissando, as if recollecting the second movement of the Two pieces. There is a brief, quarter-tonal recitando on the first violin over a sustained triad. The sempre non vibrato glissandi return and settle on the violins’ lowest open string. At this point the lamenting recitando reappears in ardent unison (once again Lutosławski may come to mind). The last word is left to the solo cello. Paweł Mykietyn also studied composition with Kotoński as well as pursuing a career as a clarinettist (he formed the group Nonstrom in his early years). Much impressed by Szymański’s ‘surconventionalism’, Mykietyn soon made his mark with humorous works like U Radka (At Radek’s, for chamber ensemble, 1993). He moved on from Baroque idioms to those to which he felt closer, such as rock music, hip-hop and trip-hop. Among his most compelling works are two symphonies (2007, 2011) and the St Mark Passion (2008). This last work virtuosically combines many musical worlds, setting Polish and Hebrew, as well as telling the story backwards and inserting Christ’s genealogy as a separate thread. Mykietyn’s award-winning music for film and the theatre also colours his creative outlook, and Wax Music for wax cylinders and piano (2012) confirms his experimental drive. His music this century is also profoundly engaged in microtonality. Shakespeare’s Sonnets for male soprano and piano (2000) was a notable staging post and the second string quartet (2006) reinforces this aspect of his music. Mykietyn’s String Quartet No 2 (2006) was written for the Kronos Quartet, who gave the premiere in Kraków on 11 November 2006. Cast in a single, multi-sectioned span, it establishes a microtonal language as its norm. Those brief moments where conventional semitonal tuning dominates seem almost alien. Mykietyn is captivated by harmonics—as is Szymański—and their high partials call to mind the timbral qualities of the accordion or glass harmonica. The opening section interlocks two subtly different phrases made up of individual ostinati. As these begin to disintegrate (hints, perhaps, of the finale of Beethoven’s Violin Concerto? ), there is the first semitonal flourish (first violin), setting a developmental pattern of continuity of arching harmonics gradually overtaken by other ideas, rather in the manner of Lutosławski’s ‘chain’ technique. Some of these ideas have an eighteenth-century flavour, but the most striking of them is first heard in a descent of overlapping harmonics, above a repeated cello D natural. This will prove to be the work’s principal thematic riff. After further intercutting of semitonal and quarter-tonal passages, a drone-like texture appears, with the viola exploring its C quarter-sharp, above the cello’s more stable octaves, in a manner associated with the tuning-up of bagpipes. The cello then takes command, playing pizzicato cantabile. When the other instruments rejoin, the folk-like atmosphere becomes unmistakable: we hear not only the drone but also the highly ornamented violin line and, shortly after, the return of the main riff. The quartet has become a lyrical and through-composed extemporization. A short passage of descending glissandi transforms into a coda of sparkling harmonics, concluding with an allusion to a brief moment heard earlier in the quartet. Les noms de Paweł Szymański (né en 1954) et de Paweł Mykietyn (né en 1971) ne sont peut-être pas aussi largement connus que ceux de compositeurs polonais nés avant la Seconde Guerre mondiale comme Witold Lutosławski, Krzysztof Penderecki ou Henryk Mikołaj Górecki, dont le Royal String Quartet a enregistré tous les quatuors à cordes pour le label Hyperion. En Pologne même, cependant, Szymański et Mykietyn ont longtemps été regardés comme l’avant-garde d’une nouvelle orientation de la musique du pays. Leurs productions couvrent la musique de chambre, les pièces orchestrales, la musique chorale et vocale, l’opéra et la musique de scène et de film. Paweł Szymański se fit d’abord connaître à la fin des années 1970, après avoir été l’élève de grands compositeurs à Varsovie (Włodzimierz Kotoński et Tadeusz Baird) et à Vienne (Roman Haubenstock-Ramati). D’emblée son style compositionnel et son approche esthétique s’avérèrent singuliers. Sa musique déploie un profond lien, mais aussi une distance ironique, parfois troublante, avec les conventions du passé. Très souvent, Szymański est inspiré par le XVIIIe siècle, comme dans sa Sonate pour violons, contrebasse et percussion (1982) ou sa Partita IV orchestrale (1986). À la base de sa musique se trouvent fréquemment un canon ou une fugue écrits en toutes notes, qu’il crible ensuite de pauses ou atténue du tout au tout. Szymański a baptisé «surconventionnalisme» son traitement d’un matériau bâti avec ou sans emprunt. D’autres pourraient parler de «postmodernisme». Ses sources vont de la mélodie médiévale «L’homme armé» (ainsi dans Lux aeterna, 1984) à une mazurka récente de Karol Szymanowski (dans la Sonate). Le Concerto pour piano (1994), dont les syncopes jazzy du premier mouvement sont agrémentées par la polyphonie paisible, extrêmement traînante, du second, illustre sa tendresse pour les structures bipartites. Son large éventail—allant de morceaux aphoristiques à de vastes œuvres comme l’opéra Qudsja Zaher (2005, créé en 2013)—ne laisse d’étonner, tout comme ses titres souvent donquichottesques (telles les Four Hevelian Dances pour orgue et deux positifs, 2011) et sa répugnance à dire quoi que ce soit concernant sa musique. Parfois, Szymański préfère des titres évasifs, comme l’illustrent les trois présents quatuors à cordes. Le diptyque Deux pièces pour quatuor à cordes (1982) fut créé le 1er octobre 1983 par le Musica Nova Quartet lors des Szymanowski Music Days, à Zakopane. Comme la Sonate, il fut rédigé pour le centenaire de la naissance de Szymanowski—dont la musique est ici, toutefois, bien masquée. L’insistance sur mi bémol (Es dans la terminologie polonaise) pourrait renvoyer au S de Szymanowski. Mais comme cette œuvre fut terminée en janvier 1982, juste un mois après la proclamation de la loi martiale en Pologne, cela pourrait tout autant symboliser le syndicat réprimé Solidarność (Solidarité). Chose plus importante, les Deux pièces sont un exemple précoce de structure bipartite, dont le vocabulaire musical présente peu de liens ouverts avec des sources externes. Nées dix ans plus tard (1992) en réponse à une commande de la BBC, les Cinq pièces pour quatuor à cordes furent créées en août 1993 par le Brodsky Quartet et diffusées sur la BBC Radio 3. Elles furent conçues à la mémoire du peintre polonais Jerzy Stajuda (1936–1992), plus célèbre pour ses images voilées et ses badigeons que pour ses tracés précis; il faisait l’admiration de nombreux musiciens, dont Lutosławski. Ce corpus de cinq miniatures montre d’abord un Szymański enjoué. L’idiome commence par sonner authentiquement dix-huitième mais la figuration ne tarde pas à se rompre, des glissandi l’étirent et la distordent en tous sens, laissant parfois poindre une harmonie diatonique. Un paisible accord de mi bémol est bientôt écarté et le morceau s’achève sur une exploration bourrue de l’ut de la corde à vide du violoncelle, l’injonction finale commandant de «terminer ce son sur un crissement». Le tic-tac de la courte deuxième pièce (avec, de nouveau, un cœur mi bémol–la) attire une foule d’autres élans, avant d’être supplanté par de chevauchantes figures avec l’archet et par une fioriture conclusive esquissant une septième de dominante sur fa (qui demeurera non résolue). La troisième pièce est peut-être celle qui suit au plus près l’esthétique de Stajuda. Passé un carillon d’harmoniques, Szymański introduit de subtils trilles, détours et motifs évoquant les figures du XVIIIe siècle, qui s’évanouissent sitôt apparus. Les deux dernières pièces sont davantage robustes. Au début de la quatrième, de chevauchants arpèges d’ut mineur pourraient suggérer un lien avec le minimalisme américain, mais le contraste presque immédiat avec les sol naturels répétés indique que Szymański visait autre chose. Il y a, dans l’obstination tonale et figurative de cette musique, une férocité qui, dans son contexte confiné, atteint à un effondrement cataclysmique. Les tritons multiples descendants se cristallisent dans la cinquième pièce, dont l’insistant triton fa–si est brillamment contextualisé comme appartenant à une autre septième de dominante et compensé par de fugaces accords parfaits majeurs/mineurs. Les Quatre pièces pour quatuor à cordes (2013) sont dédiées au Royal String Quartet, qui les créa lors du festival Kwartesencja, à Varsovie, le 8 novembre 2013. Les quatre sections s’enchaînent sans interruption. Leur langage musical démontre la constante fascination de Szymański pour les allusions tonalo-stylistiques comme pour les procédés flous et les structures énigmatiques. La première pièce démarre sans ambages, sur des cordes à vide et jouées, des inflexions microtonales et des unissons déplacés. Que ce soit par accident ou à dessein, elle utilise un processus cumulatif de hauteurs de son fort similaire à celui employé par Lutosławski dans le premier de ses novateurs Five Songs (1957): une échelle de tierces sur les notes «blanches», partant sur ré au-dessus de l’ut central (pour utiliser une terminologie claviéristique) pour atteindre le si au-dessus de la portée supérieure. Ces sept hauteurs sont mêlées aux cinq notes «noires». Outre une vivacité rythmique et une durée accrues, la version szymańskienne de ce procédé se distingue de la lutosławskienne en ce que les notes chromatiques («noires») y sont souvent des trois-quarts de ton bémol au lieu d’un demi-ton. Le schéma est rompu par des fa dièses aigus à l’unisson, qui mènent au second morceau, centré d’abord sur des ut aigus. Les ostinati variables de Szymański sont articulés ici par des timbres vivement contrastifs. Une brève déviation du matériau annonce le début de la troisième pièce. Quoique s’ouvrant sur des tierces mineures répétées, échos de la pièce inaugurale, elle se précipite bientôt dans un laisser-aller débridé, presque comique, plonge dans un glissando groupé, s’arrête, reprend et bredouille jusqu’au finale, lequel retrouve le glissando groupé, comme un souvenir du second mouvement des Deux pièces. Un court recitando microtonal est exécuté au premier violon par-dessus un accord parfait tenu. Les glissandi sempre non vibrato reviennent s’installer sur la plus grave des cordes à vide des violons. C’est alors que le recitando éploré resurgit en un ardent unisson (et l’on peut, une fois encore, penser à Lutosławski). Le dernier mot est au violoncelle solo. Paweł Mykietyn étudia également la composition avec Kotoński tout en poursuivant une carrière de clarinettiste (il forma, dans ses jeunes années, le groupe Nonstrom). Fort impressionné par le «surconventionnalisme» de Szymański, il s’imposa bientôt avec des œuvres pleines d’humour comme U Radka (pour ensemble de chambre, 1993). Par la suite, il délaissa les idiomes baroques pour des styles dont il se sentait plus proche, comme la musique rock, le hip-hop et le trip-hop. Parmi ses œuvres les plus séduisantes figurent les deux symphonies de 2007 et 2011 ou encore la St Mark Passion (2008), mariage virtuose de multiples univers musicaux, avec des textes polonais et hébreux, qui remonte le fil de l’histoire et insère à part la généalogie du Christ. Mykietyn voit également sa conception créative mûrie par ses musiques de film et de scène, couronnées de prix, et Wax Music pour cylindres de cire et piano (2012) confirme sa soif d’expérimentation. Sa musique du XXIe siècle est aussi très engagée dans la microtonalité. Les Shakespeare’s Sonnets pour soprano masculin et piano (2000) constituèrent, à cet égard, un jalon remarquable, consolidé par le deuxième quatuor à cordes (2006). Le Quatuor à cordes nº 2 (2006) de Mykietyn fut écrit pour le Kronos Quartet, qui le créa à Kraków le 11 novembre 2006. Coulé en un seul volet à plusieurs sections, il pose pour norme un langage microtonal. Les brefs moments où l’accord semi-tonal conventionnel domine paraissent presque étrangers. Mykietyn est captivé par les harmoniques—comme Szymański—et leurs sons partiels aigus rappellent les qualités timbriques de l’accordéon ou de l’armonica de verre. La section inaugurale entrelace deux phrases subtilement différentes, faites d’ostinati singuliers. Alors que leur désintégration s’amorce (allusion au finale du Concerto pour violon de Beethoven? ), la première fioriture semi-tonale (premier violon) survient, instaurant un modèle de développement fait d’une continuité d’harmoniques en arche progressivement dépassés par d’autres idées, un peu à la manière de la technique de «chaîne» lutosławskienne. Certaines de ces idées ont un parfum dix-huitième mais la plus saisissante s’entend pour la première fois dans une descente d’harmoniques qui se chevauchent, par-dessus un ré naturel répété, au violoncelle. Ce sera le principal riff thématique de l’œuvre. Après d’autres passages contrastifs semi-tonals et microtonals, une texture façon bourdon apparaît: l’alto explore son ut microtonal, par-dessus les octaves plus stables du violoncelle, d’une manière associée à l’accordage des cornemuses. Le violoncelle prend ensuite les rênes et joue pizzicato cantabile. Quand les autres instruments le rejoignent, l’atmosphère folklorisante devient évidente: on entend et le bourdon et la ligne de violon très ornée puis, peu après, le retour du riff principal. Le quatuor s’est fait improvisation lyrique et durchkomponiert. Un court passage de glissandi descendants se change en une coda aux harmoniques scintillants pour terminer sur une allusion à un court moment entendu plus tôt dans le quatuor. Die Namen Paweł Szymański (geb. 1954) und Paweł Mykietyn (geb. 1971) mögen nicht so bekannt sein wie die der polnischen Komponisten, die vor dem Zweiten Weltkrieg geboren wurden, wie etwa Witold Lutosławski, Krzysztof Penderecki oder Henryk Mikołaj Górecki, von denen das Royal String Quartet sämtliche Streichquartette für Hyperion eingespielt hat. In Polen hingegen gelten Szymański und Mykietyn schon seit Langem als Vorreiter einer neuen Richtung in der polnischen Musik. Ihr Repertoire umfasst Kammer- und Orchestermusik, Chor- und Vokalmusik, Oper sowie Musik für das Theater und den Film. Paweł Szymański gelang gegen Ende der 1970er Jahre ein erster Durchbruch, nachdem er bei bedeutenden Komponisten in Warschau (Włodzimierz Kotoński und Tadeusz Baird) und in Wien (Roman Haubenstock-Ramati) studiert hatte. Er hatte von Anfang an einen charakteristischen ästhetischen Ansatz und Kompositionsstil. Seine Musik offenbart sowohl eine intensive Beschäftigung mit den Konventionen der Vergangenheit als auch eine ironische und zuweilen verunsichernde Distanz zu ihnen. In vielen Werken ist seine Inspiration das 18. Jahrhundert, so etwa bei der Sonata für Violinen, Kontrabass und Perkussion (1982) oder der Partita IV für Orchester (1986). Seiner Musik liegt oft ein vollständig ausgearbeiteter Kontrapunkt zugrunde, den er dann mit Pausen durchsetzt oder bis zur Unkenntlichkeit aufweicht. Szymański hat seine Behandlung von geliehenem oder selbst konstruiertem Material „Über-Konventionalismus“ genannt; andere würden wohl den Terminus „Postmoderne“ verwenden. Seine Inspirationsquellen können so weit zurückreichen wie zu der mittelalterlichen Melodie „L’homme armé“ (wie in Lux aeterna, 1984), oder auch zu einer neueren Mazurka von Karol Szymanowski (in der Sonata). Das Klavierkonzert (1994), dessen Jazz-Synkopierungen im ersten Satz der ruhigen und sehr in die Länge gezogenen Polyphonie des zweiten Satzes gegenübergestellt sind, ist ein Beispiel für Szymańskis Vorliebe für zweiteilige Strukturen. Sein schöpferisches Spektrum—von aphoristischen Stücken bis zu ausgedehnten Werken wie seiner Oper Qudsja Zaher (2005; 2013 uraufgeführt)—überrascht immer wieder, wie auch seine oft abenteuerlichen Titel (so etwa Four Hevelian Dances für große Orgel und zwei Orgelpositive, 2011) und sein Widerstreben, sich zu seiner Musik zu äußern. Zuweilen zieht Szymański auch unverbindliche Titel vor, wie es etwa anhand der drei hier vorliegenden Werke für Streichquartett zu sehen ist. Die Zwei Stücke für Streichquartett (1982) wurden am 1. Oktober 1983 anlässlich der 7. Edition der Szymanowski-Musiktage in Zakopane vom Musica Nova Quartett uraufgeführt. Ebenso wie die Sonata entstanden sie anlässlich des 100. Geburtstages von Szymanowski—sollten ihm allerdings Werke seines Landsmanns als Inspiration gedient haben, so sind diese gründlich getarnt. Die Betonung des Tons Es (der auch im Polnischen als Es bezeichnet wird) könnte auf das S von Szymanowski verweisen. Da das Werk allerdings im Januar 1982 fertiggestellt wurde, lediglich einen Monat nach der Ausrufung des Kriegsrechts in Polen, könnte es auch die unterdrückte Gewerkschaftsbewegung Solidarność (Solidarität) symbolisieren. Wichtiger jedoch ist, dass die Zwei Stücke ein frühes Beispiel für eine zweiteilige Struktur sind, deren musikalische Sprache kaum offensichtliche Verbindungen zu externen Quellen hat. Die Fünf Stücke für Streichquartett (1992) folgten zehn Jahre später. Das Werk wurde von der BBC in Auftrag gegeben und im August 1993 erstmals vom Brodsky Quartet für eine Sendung von BBC Radio 3 aufgeführt. Es war zum Andenken an den polnischen Maler Jerzy Stajuda (1936–1992) entstanden, der für seine verschleierten Bilder und Farbtöne berühmt war. Auch Lutosławski gehörte zu seinen vielen musikalischen Verehrern. Dieser Zyklus von fünf Miniaturen beginnt in ausgelassener Stimmung. Die Klangsprache klingt zunächst wie authentisches 18. Jahrhundert, doch bricht die Figuration bald ab und wird dann durch Glissandi ausgedehnt und verzerrt; diatonische Harmonie scheint nur noch ab und zu durch. Ein leiser es-Moll-Akkord wird bald abgewiesen und das Stück endet mit einer schroffen Ergründung der leeren C-Saite des Cellos, wobei die letzte Anweisung lautet, dass dieser Klang mit „einem Knarzen“ zu beenden sei. Das Ticken des kurzen zweiten Stückes (in dem das Intervall Es–A wiederum im Mittelpunkt steht) bringt eine ganze Menge anderer Impulse mit sich, bis es von einer ausgreifenden Streicher-Figur und einer Schlussgeste, in der ein Dominantseptakkord auf F (der unaufgelöst bleibt) angedeutet wird, ersetzt wird. Das dritte Stück kommt der Ästhetik Stajudas vielleicht am nächsten. Nach klingelnden Flageoletttönen lässt Szymański delikate Triller, Wendungen und Motive auftreten, welche an Figurationen des 18. Jahrhunderts erinnern, die sich so schnell verflüchtigen wie sie erschienen sind. Die letzten beiden Stücke sind robusterer Natur. Die ausgreifenden c-Moll-Arpeggien zu Beginn des vierten Stücks könnten auf den amerikanischen Minimalismus verweisen, doch verdeutlicht der fast unmittelbare Kontrast mit wiederholten Gs, dass Szymański hier ein anderes Ziel hat. Die tonale und figurative Beharrlichkeit der Musik ist derart stark, dass sie in ihrem begrenzten Kontext einen verheerenden Kollaps erzeugt. Die mehrfachen, absteigenden Tritoni kristallisieren sich im fünften Stück heraus, dessen insistierender Tritonus F–H kurz als Teil eines weiteren Dominantseptakkords kontextualisiert und von Durchgangsdreiklängen in Dur und Moll ausgeglichen wird. Die Vier Stücke für Streichquartett (2013) sind dem Royal String Quartet gewidmet, welches die Premiere des Werks im Rahmen seines Kwartesencja Festivals am 8. November 2013 in Warschau gab. Die vier Teile gehen ohne Pausen ineinander über und die musikalische Sprache verdeutlicht jeweils Szymańskis anhaltende Faszination für tonale und stilistische Anspielungen aber auch für schwer fassbare Prozesse und rätselhafte Strukturen. Das erste Stück beginnt geradeheraus, mit leeren und gegriffenen Saiten, Viertelton-Wendungen und versetzten Unisoni. Es kommt hier—ob absichtlich oder nicht—ein sehr ähnlicher, kumulativer Klangprozess zum Einsatz, wie Lutosławski ihn in dem ersten seiner bahnbrechenden Fünf Lieder (1957) verwandte: eine Terzenleiter auf „weißen“ Tönen, die auf dem eingestrichenen D beginnt und bis zum zweigestrichenen H reicht. Diese sieben Töne sind mit den fünf „schwarzen“ Noten (um in Klavier-Termini zu sprechen) verflochten. Neben der stärkeren Lebhaftigkeit und längeren Zeitspanne unterscheidet sich Szymańskis Version dieses Prozesses von Lutosławskis insofern, als dass die chromatischen („schwarzen“) Töne oft um einen Dreiviertelton anstelle eines Halbtons erniedrigt sind. Das Muster wird von zwei hohen Fissen im Unisono durchbrochen, die in das zweite Stück hineinleiten, welches zunächst hohe Cs akzentuiert. Szymańskis variable Ostinati werden hier von sich lebhaft voneinander absetzenden Timbres artikuliert. Ein leichtes Verdrehen des musikalischen Materials kündigt den Beginn des dritten Stücks an. Obwohl es mit wiederholten kleinen Terzen anfängt, die an das erste Stück erinnern, flitzt das dritte mit wilder, fast komischer Hemmungslosigkeit davon, gleitet in einem Gruppen-Glissando hinab, hält inne, fährt fort und stottert sich dann ins Finale hinein. Dieses greift das Gruppen-Glissando wieder auf, also ob es an den zweiten Satz der Zwei Stücke erinnerte. Es folgt ein kurzes, vierteltöniges Recitando der zweiten Geige über einem ausgehaltenen Dreiklang. Die Glissandi, sempre non vibrato, kehren wieder und versammeln sich dann auf der tiefsten leeren Saite der Geigen. An dieser Stelle kehrt das lamentierende Recitando wieder, in inbrünstigem Unisono (wobei man sich möglicherweise wiederum an Lutosławski erinnert fühlt). Das Solo-Cello hat das letzte Wort. Paweł Mykietyn studierte ebenfalls bei Kotoński und verfolgte gleichzeitig eine Karriere als Klarinettist (er gründete sein Ensemble Nonstrom bereits in jungen Jahren). Mykietyn war von Szymańskis „Über-Konventionalismus“ beeindruckt und trat bald mit humorvollen Werken wie U Radka für Klarinette, Posaune, Cello und Klavier (1993) hervor. Er ließ die barocke Klangsprache hinter sich und wandte sich Stilen zu, die ihm näher waren, so etwa der Rockmusik, dem Hip-Hop und Trip-Hop. Zu seinen fesselndsten Werken gehören die beiden Symphonien (2007 und 2011) sowie die Markus-Passion (2008). In Letzterem werden in virtuoser Weise viele musikalische Sphären miteinander kombiniert; der Text ist in hebräischer und polnischer Sprache verfasst, die Geschichte wird rückwärts erzählt und Christi Stammfolge ist als separater Strang eingefügt. Mykietyns preisgekrönte Film- und Theatermusik gibt seiner schöpferischen Perspektive einen weiteren Anstrich, und Wachs-Musik für Wachswalzen und Klavier (2012) demonstriert seine Freude am Experimentieren. Sein Schaffen in diesem Jahrhundert setzt sich zudem eingehend mit Mikrotonalität auseinander. Shakespeare-Sonette für männlichen Sopran und Klavier (2000) war ein wichtiger Meilenstein und das zweite Streichquartett (2006) verstärkt ebenfalls diesen Aspekt seiner Musik. Mykietyns Streichquartett Nr. 2 (2006) entstand für das Kronos Quartet, welches am 11. November 2006 in Kraków die Uraufführung gab. Die einsätzige Anlage teilt sich in mehrere Abschnitte, in denen sich eine mikrotonale Klangsprache als Norm etabliert. Die kurzen Momente, in denen eine konventionelle halbtönige Stimmung vorherrscht, muten fast fremd an. Mykietyn ist von Flageoletttönen fasziniert—ebenso wie Szymański—und ihre hohen Partialtöne erinnern an die klanglichen Eigenschaften des Akkordeons oder der Glasharmonika. Zu Beginn werden zwei Phrasen mit fast unmerklichen Unterschieden und individuellen Ostinati miteinander verschränkt. Wenn diese anfangen, auseinanderzufallen (wird hier möglicherweise auf den Finalsatz von Beethovens Violinkonzert angespielt? ), findet die erste halbtönige Figuration (in der ersten Violine) statt, wodurch ein Entwicklungsmuster der Kontinuität von Flageolett-Bögen entsteht, was allmählich von anderen Motiven ersetzt wird, quasi gemäß der „Ketten-Technik“ von Lutosławski. Einige dieser Motive erinnern an das 18. Jahrhundert, doch das bemerkenswerteste ist erstmals in einem Abstieg von sich überlappenden Flageoletttönen, oberhalb eines wiederholten Ds des Cellos, zu hören. Dieses Motiv erweist sich dann als das wichtigste thematische Riff des Werks. Nachdem weitere halb- und vierteltönige Passagen erklungen sind, erscheint eine bordunartige Textur, in der sich die Bratsche mit ihrem um einen Viertelton erhöhten C auseinandersetzt, während das Cello stabilere Oktaven spielt, was in der Art und Weise an das Stimmen von Dudelsäcken erinnert. Das Cello übernimmt dann mit einem kantablen Pizzicato die Führung. Wenn die anderen Instrumente einfallen, stellt sich ganz deutlich eine volksmusikartige Atmosphäre ein: nicht nur sind die Bordunklänge zu hören, sondern auch die äußerst verzierte Geigenlinie sowie, kurz danach, die Wiederkehr des Haupt-Riffs. Das Quartett hat sich zu einer lyrischen und durchkomponierten Improvisation entwickelt. Eine kurze Passage abwärts gerichteter Glissandi verwandelt sich in eine Coda mit funkelnden Flageoletttönen und beschließt das Werk mit einer Anspielung auf einen kurzen Moment, der früher in dem Werk erklungen war.